You are currently browsing the tag archive for the ‘jobs’ tag. Lou Dobbs of Fox Business thinks that President Trump is abandoning the America First policy upon which he campaigned in 2016. Lou was referring to Trump’s Workforce Policy Advisory Board meeting held on Wednesday, March 6, 2019. Before I get to Lou’s segment on this, aired the same day, here is a White House transcript and a bit of background about the event, which was open to the media. Ivanka Trump is heading this council, working with commerce secretary Wilbur Ross and the heads of seven US corporations along with other organisations, such as the Boys & Girls Clubs of America and think tanks such as the Milken Institute. Now that the US unemployment rate is so low historically, it would appear that it is time to import more foreign workers. Really? Q Mr. President, how much more immigration would you like to see in this (inaudible)? THE PRESIDENT: Well, we’re going to have a lot of people coming into the country. We want a lot of people coming in. And we need it. It’s not a question of do we want it. These folks are going to have to, sort of, not expand too much. And if you tell them — these are very ambitious people around this table. They don’t like the concept of not expanding. Would you say that’s right, Barbara? Barbara is not into non-expansion. So we want to have the companies grow. And the only way they’re going to grow is if we give them the workers. And the only way we’re going to have the workers is to do exactly what we’re doing. On the one hand, President Trump is reiterating what he said on the 2016 campaign trail about immigrants coming in through a system of vetting. On the other hand, the US has had that for years with the H-1B visas for specialist workers, such as those in high tech. For many Americans, Trump’s Workforce panel will be pursuing immigration as usual. When will American adults ever catch up to be able to get those high tech jobs? Once again, it looks as if they are being passed over for foreign workers. Is it because foreign workers will do those jobs for a little bit less? Stop what you are doing and watch this! Lou Dobbs, Hero of MAGA, Blasting the White House for their shift away from the America First Immigration Platform President Trump won on! Lou concludes by urging Americans to contact their Congressional representatives — and the White House — about this errant policy that will surely reverse the record-breaking employment efforts made during the first two years of the Trump presidency. If the White House persists with this policy, it will be returning to business as usual with the Swamp alive and well for decades to come. More Americans were able to treat themselves to steak on Labor Day, Monday, September 3. A buzzing economy and low U.S. unemployment is a boon for beef, typically considered a premium meat. Gains for the cattle herd means retail prices have fallen. Combine that with grocer discounts for the holiday, and steaks and burgers could be the cheapest they’ve been in years, attracting demand. Meanwhile, other meats are in the doldrums. There are record supplies of chicken and pork in the U.S., and even with prices at multiyear lows, it’s more than most people care to eat. Companies including Tyson Foods Inc. and Sanderson Farms Inc. have recently said that bargains on beef were hurting poultry. Americans are hungry for burgers and steaks partly because they’ve been deprived. A drought caused ranchers to reduce herds to a six-decade low in 2014, and beef prices shot up to an all-time high. The meat was so expensive it forced consumers to cut back, with consumption declining to the lowest since the 1970s. Now, even with cheaper prices and bigger supplies, demand still hasn’t bounced back to where it was before the recession, Sawyer said. That means there’s still plenty of room for increased buying. 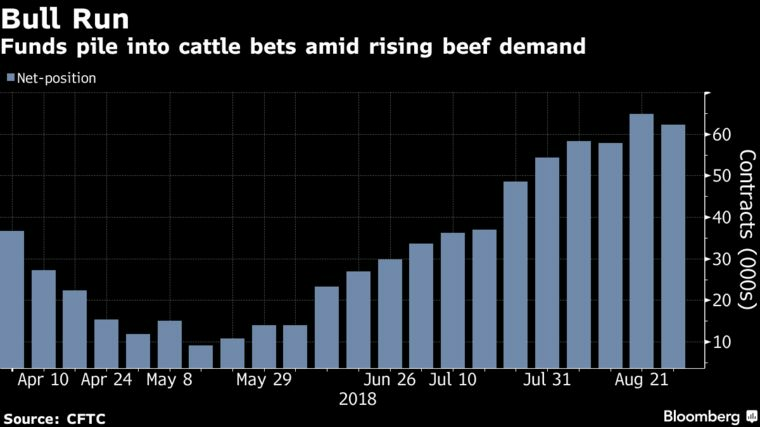 Beef consumption will rise 1.4 percent this year to 57.7 pounds on a per-capita basis, the U.S. Department of Agriculture said this month. Demand will grow to 58.7 pounds next year, the agency estimates. The Worker in America is doing better than ever before. Celebrate Labor Day! Because Jobs in the U.S. are doing so well, Americans receiving unemployment aid is the lowest since 1973. Great! By June, thanks to President Trump, the US had its lowest unemployment rate in recorded American history!
. @BLS_gov reports 223,000 new payroll jobs in May, and the national unemployment rate down a tenth to 3.8%, lowest since April 2000. I am in Milwaukee, Wisconsin, for meetings. Soon to leave for a big groundbreaking for Foxconn, which is building a great new electronics plant in Wisconsin. 15,000 Jobs, so great! On August 5, the Gateway Pundit reported that nearly 25% of all US jobs created in the 21st century can be credited to President Trump. The percentage of American workers satisfied with their jobs has rose to 51 percent in 2017, the highest level since 2005, according to The Conference Board. #Unemployment claims are at their lowest level in 50- years… lowest levels ever recorded for Hispanics and African-Americans, lowest level for women in 19 years. Wages growing at fastest pace in a decade. – @POTUS @realDonaldTrump speaking at tax cuts rally in the Rose Garden. Black unemployment under 6% for the first time in history! Democrats, tell me again why anyone should vote for you and your economic policies ever again? ….The fact is that African/American unemployment is now the lowest in the history of our country. Same with Asian, Hispanic and almost every other group. The Democrats have been all talk and no action. My Administration has already produced like no other, and everyone sees it!
. @realDonaldTrump has helped grow our economy for all Americans. I'm a middle class American, who lives in a single bedroom apartment, shops at Walmart, & doesn't even own a television. I earn $51.99 more per paycheck because of Trump's Tax Cuts and Jobs Act. Democrats want to take my tax cuts away. I promise to vote Republican this November. The Tax Cuts and Jobs Act has boosted take-home pay for 90 percent of wage earners and the economy is booming. I’ll be the greatest jobs president God ever created.